Product Condition: The Air Zoom Terra Kiger 4 Trail Running Shoe - Women's is in Excellent condition. These shoes were previously owned for three weeks. The following observations were made regarding these item. *They were used for an occasion. *There aren't any defects in them at all. *They got a little dirty, cleanable. *Vendor box is missing. *All items sold as is, all warranties void. 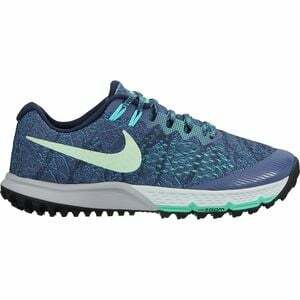 Horse power meets intuitive design in the Nike Women's Air Zoom Terra Kiger 4 Trail Running Shoe. Designed to assure unencumbered mobility as you navigate tough trails, the Terra Kiger features Nike's Flymesh technology, which not only provides ample breathability, but also prevents the build up of hot spots and chafing. A sockliner provides a next-to-skin comfortable feel, while the Dynamic Fit and Flywire cables assure a personalized, pressure-free fit. Additionally, the Phylon midsole attenuates shock and enhances energy return, and the Zoom units in the heel and forefoot bolster your transitions, so you're able to up-the-anty on your cadence and make the most of the training time that's available to you. Not to mention, the rubber outsole touts multi-directional and substantial lugs for ample traction when you need it most, without overwhelming the weight of the shoe.